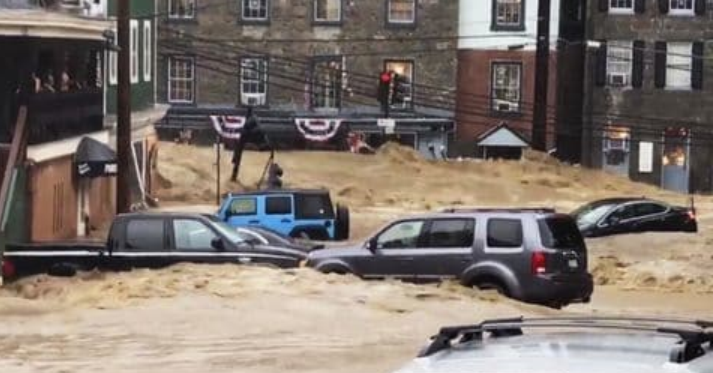 Unrelenting rain led to serious flooding in Ellicott City, MD where a flash flood emergency was issued on Sunday by the National Weather Service as streets turned into raging rivers and overflowing waterways rushed towards communities. One local weather station nearby in Catonsville, MD reported 10.38 inches of rain had fallen on Sunday, which was quite a different story from the beginning of the month when 40% of Maryland was experiencing abnormally dry conditions. Rushing water took over Main Street in Ellicott City, MD. Photo courtesy of The Washington Post. Located in a valley where two major waterways meet the Patapsco River, Ellicott City is unfortunately no stranger to floods of this magnitude. The first recorded flood in this area was in 1868 when the river rose five feet in just ten minutes. And less than two years ago, this same city, located 15 miles west of Baltimore, was flooded when 6.5 inches of rain fell within three hours in July of 2016, causing about $22 million worth of damage. Water rushed down the Main Street of the city, submerging cars and closing many local businesses. The largest one-day precipitation event in Maryland was on September 1, 2002 when 14.31 inches of rain fell before 2pm that day, near Snow Hill, MD. The heavy rainfall caught many by surprise, since much of the mid-Atlantic was in the midst of a significant drought during that time. 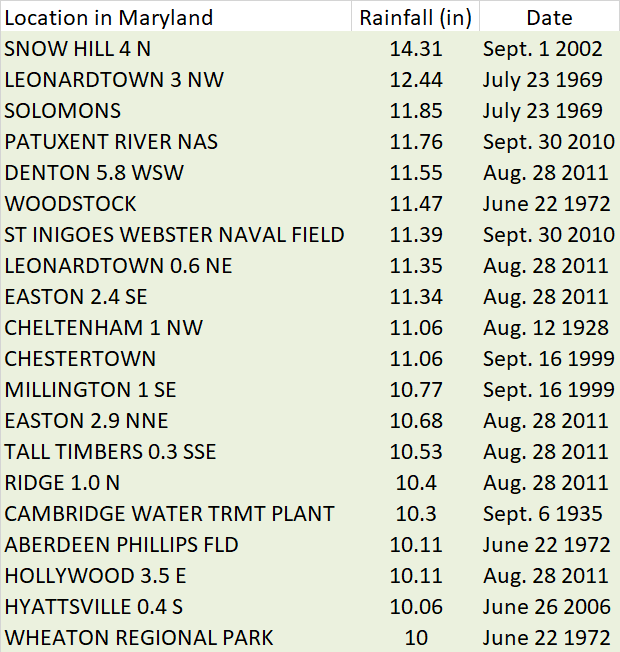 There have been 20 instances where ten or more inches of rain have fallen in the span of one day in Maryland, and eight of those occurred during Hurricane Agnes in 1972 or Hurricane Irene in 2011. Areas in Maryland where ten or more inches of rain were recorded within one day. 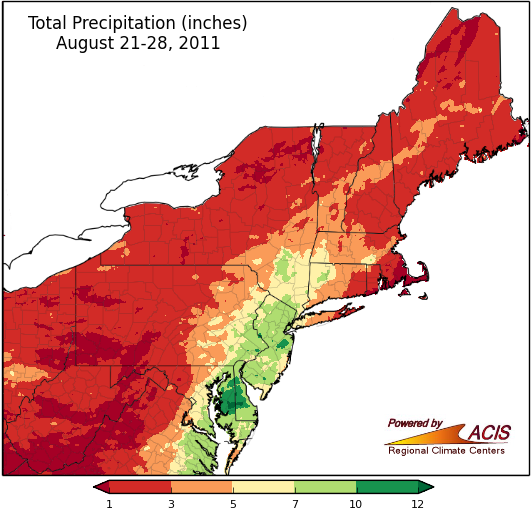 Hurricane Irene brought heavy rain to much of the East Coast in August of 2011. 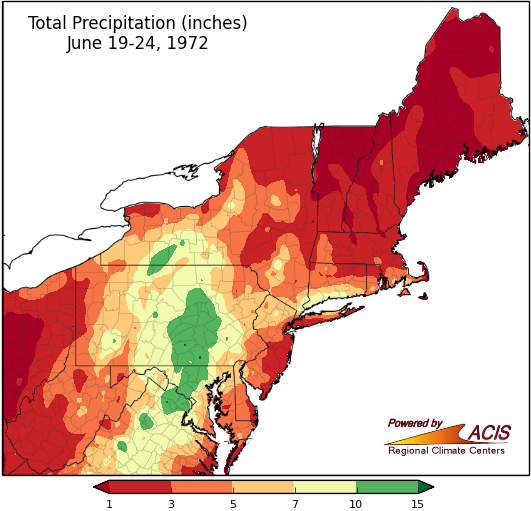 In 1972, Hurricane Agnes brought heavy rain and flooding to much of the East Coast in late June.